According to "Scribe America," a company that has created an ER Scribe program specifically to increase emergency department efficiency, "a scribe is a physician collaborator who fulfills the primary secretarial and non-medical functions of the busy emergency physician." In emergency rooms across the country, a doctor can take up to half of his/her time dealing with documentation of a patient's visit. This added paperwork lengthens patients' emergency room stays and reduces the overall number of patients a doctor is able to see within his/her shift. The job of the ER Scribe is basically to take care of all documentation and required paperwork for the doctor during ER visits, allowing the physician to focus more closely on the patient and to see more patients during his/her shift. Scribe programs have been shown to benefit ER doctors and their patients tremendously, expediting the ER process by as much as 30-40%. Various doctors across the nation have attested to the importance and significance of such a program in the emergency room. In testimonials on ScribeAmerica's website, Dr. David Strumpf, an Emergency Physician at Santa Barbara Cottage Hospital in California, gave his personal opinion of the importance of Scribes in emergency rooms everywhere. "Our scribes have been well accepted by patients and staff alike. The scribes have off-loaded nurses work by checking lab and x-ray reports and in their down time they assist in filing and finding old records. This program has been successful by all accounts and I would strongly support continuing it. These scribes are a wonderful bunch of students, their high energy and positive attitude enhances the overall working environment for the entire staff," stated Dr. Strumpf. Dr. Luis Moreno, an Emergency Physician at Antelope Valley Hospital, expressed on ScribeAmerica's website the significance of Scribes in the ER. "By releasing me from routine, yet, time consuming documentation and by hunting down tardy labs and x-rays, I can see 30 percent more patients per shift...my productivity has increased, my patients are more satisfied, and our department's revenue is up!" stated Dr. Moreno. In addition to helping ER doctors better care for their patients, scribe programs also provide an invaluable opportunity for aspiring MD/MD-PhDs in which they are able to experience first-hand doctor-patient interactions, the extensive process of the medical diagnosis, and the organizational skills required of doctors to efficiently and effectively care for and treat patients. Such exposure and experience is unparalleled by few if any other medical internships available to undergraduates. Also, the ER Scribe is responsible for knowing and understanding medical terminology in order to better facilitate the process of chart-keeping in the ER. Not only does this skill enhance the scribe's ability to accurately chart and document, it also allows the participant to get the most out of the scribe experience. Though scribes work primarily with their assigned physicians, they also work with all emergency room staff, including nurses, technicians, secretaries, X-ray technicians, and respiratory therapists. As a scribe spends more time in the emergency room exposed to the medical atmosphere and procedure, he/she will become an integral part of the emergency room staff, and help facilitate the work flow in the ER. While scribe programs in the United States are relatively new, they have already produced more efficient emergency room visits, as well as aspiring medical students with invaluable and unique experience that will sustain them throughout medical school and into their careers. Scribes are a relatively new addition to ER departments across the United States. The program took off in 1995 at Harris Methodist Hospital in Fort Worth, Texas, when an ER doctor with accused poor penmanship decided to recruit pre-med students to do his chart documentation, borrowing the idea from another hospital in Nevada. Eleven years later, ER Scribe programs are emerging throughout the country as hospitals everywhere begin to realize the importance and relevance of such a job to doctors, patients, and pre-medical students. 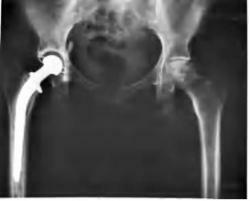 This is an X-ray image of a patient's metal right hip replacement. ER Scribes are constantly exposed to such medical technology, and therefore gain an advantage in reading X-rays upon entering medical school. Image courtesy the National Institute of Health, posted on Wikimedia Commons. One prestigious ER Scribe program that has successfully grown from its western roots in Texas has recently been started in Eastern Virginia. This program, headed by TeamHealth, services three primary hospitals: Mary Immaculate Hospital in Hampton, Maryview Medical Center in Portsmouth, and DePaul Medical Center in Norfolk. The ER Scribe program began in Eastern Virginia at these three hospitals when an ER physician named Dr. Clare brought the program from Harris Methodist to Sentara Williamsburg Community Hospital with the help of a Harris Methodist Scribe. Dr. Clare then worked with Virginia Peninsula Emergency Physicians to set up a scribe program at Mary Immaculate Hospital. About a year later, the program's success spread as new scribe programs headed by TeamHealth moved to Maryview Medical Center and DePaul Medical Center. Team Health now operates the scribe programs at these three hospitals." A doctor checking a patient's blood pressure. The Scribe accompanies the physician during his/her encounters with patients and documents initial histories, procedures, and the progress of the patient among other things. Image courtesy the National Institute of Health, posted on Wikimedia Commons. Priscilla Cha, a Head Scribe for Mary Immaculate Hospital in Hampton, Virginia, states that she first became involved in the Virginia Scribe program headed by TeamHealth in her last year of college. "I was recruited for the new program being established for Mary Immaculate Hospital in May 2005. I decided to become involved due to the vast amount of exposure and experience that students gain from the program." After being involved in the program for a matter of months, Cha was promoted to the position of Head Scribe. She states that her experience thus far in the Scribe program has already given her such extensive exposure to all aspects of medicine and medical specialties that it has helped her decide her plans for her future. "I have a greater understanding of what specialty I'd prefer, the importance of business in medicine, the medical legal aspect of medicine, and exposure to various clinical cases," she said. Another Head Scribe for the TeamHealth program, Ryan Stevenson, helped start the ER Scribe program at Depaul Medical Center in Norfolk, Virginia after already working as a Scribe in numerous other emergency room settings. He stated that he first became involved in a Scribe program at Sentara Williamsburg Community Hospital after he graduated to improve his application to medical school. "I began working in the Williamsburg Scribe Program in July of 2004 after I graduated from William and Mary [College]. I wanted to gain clinical exposure to bolster my medical school application." After working as a Scribe for about two and a half years, Stevenson states that the experience thus far has been rewarding as well as life-altering. "The two and a half years that I have spent working side-by-side with physicians and Emergency Department staff has given me the opportunity to experience almost all aspects of clinical care. It has provided me with a full-time job that directly correlates to the career path that I am pursuing. I have worked in 6 different Emergency Departments with countless physicians that all have different mannerisms and approaches to medicine. I have probably seen 10,000+ patients and the knowledge gained from reviewing histories, examinations, diagnostic tests, and treatment plans with the attending physicians has given me something that no other position can offer  a confirmation that my goal of practicing medicine is achievable." Cha and Stevenson, both success stories and walking proof of the prestige of scribe programs, agree that the experience they have gained as a scribe is unparalleled to any obtained elsewhere for an aspiring medical student. Stevenson, who has already been accepted into medical school at St. George's University School of Medicine in the Southern Caribbean, states that students who have graduated from the Scribe program enter medical school with an amazing knowledge base well beyond their years. "They say that the introduction to vocabulary, medical decision making, and bedside manner provided a strong basis for the curriculum in both the classroom and clinical portions of medical school." Cha, who maintains her position of Head Scribe of Mary Immaculate Hospital until entering into medical school next fall, says that students who have gone on to medical school after being involved in the program have an early exposure to various specialties that they could potentially specialize in after medical school. "Many students actually go into ER medicine. The program gave them insight into what specialty they would like to practice and placed them ahead of other students clinically." With the broad range of exposure ER Scribes have to medically-related careers, the position of ER Scribe can prove priceless to any science-majoring student, whether they want to go into any medical field or research. Such a program that requires knowledge of medical terminology, the ability to multi-task and such responsibility is exactly the experience medical schools and graduate programs across the nation look for in applicants. Both Cha and Stevenson express their sincere desire for ER Scribe programs to continue spreading across the United States, not only to facilitate emergency room care, but also to help undergraduates become even better medical scientists and doctors. "I hope that current students from area schools hoping to start a career in clinical healthcare will hear about the opportunity the scribe program offers and apply for the position," Stevenson said. "The program provides the chance to work in a paid position that increases your exposure to medical concepts and physician skills." "I hope that by the new involvement of the program with Team Health, a multi-national company, the program will be available to students at many other colleges across the country," states Cha. While the benefits of an ER Scribe program are fairly obvious with respect to doctors, patients, and students, the opportunity it presents for peer-to-peer education is nearly unparalleled by any other position in the health care profession. "The program is self-reliant in that the current scribes are responsible for recruiting, hiring, and training the next class of scribes," attests Stevenson. Such an approach to peer-to-peer education intensifies in pre-medical participants the importance of the team approach in medicine and introduces such an ideal early in a future doctor's career. The medical world is a melting pot of various specialties and sub-specialties, technicians and nurses, therapists and now scribes, whose skills are carefully placed together in an attempt to treat those in need efficiently and effectively. Such a system works well due to a mutual respect and necessity for collaboration in order to achieve maximum medical efficiency. Aspiring doctors should be exposed to this mutual respect and collaboration as early in their careers as possible. The scribe program provides just the opportunity for students to witness and be a part of the medical melting pot of America. Imagine having the life-long dream of being someone who spends most of their days and therefore most of their lives helping people. Imagine starting to live your dream 8 to 10 years earlier than you would normally have due to an incredible opportunity presented to you by those who are already doing what you wish to do. ER Scribe programs have been and will continue to be that incredible opportunity for millions of medical students across the country. If you wish to know whether there's already an ER Scribe program at a hospital near you, contact your college's health advisor and talk to any students you know at your school that are already a part of the Scribe program. They will surely tell you the truth about the experience, as well as the wonderful and fulfilling rewards it holds for all participants, from the doctors, to the patient, to the scribe.